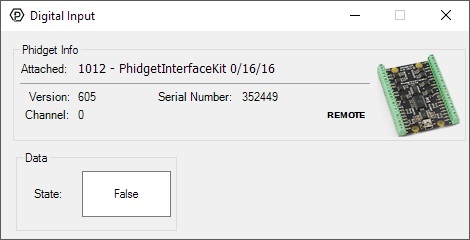 Replaced by the 1012_2B - PhidgetInterfaceKit 0/16/16. It is the exact same device, but you can now choose which length of usb cable (if any) you want to include in your order. The Digital Inputs are activated by an external voltage source, triggering on a wide voltage range: 4 to 30VDC. They provide built-in filtering, to eliminate false triggering from electrical noise. They can be used to convey the state of on/off devices, such as push buttons, limit switches, relays. 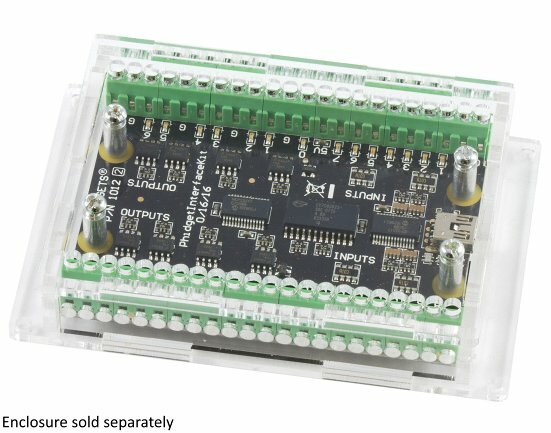 The Open Collector Digital Outputs can be used to directly control substantial devices, switching up to 30VDC at up to 2 Amps. 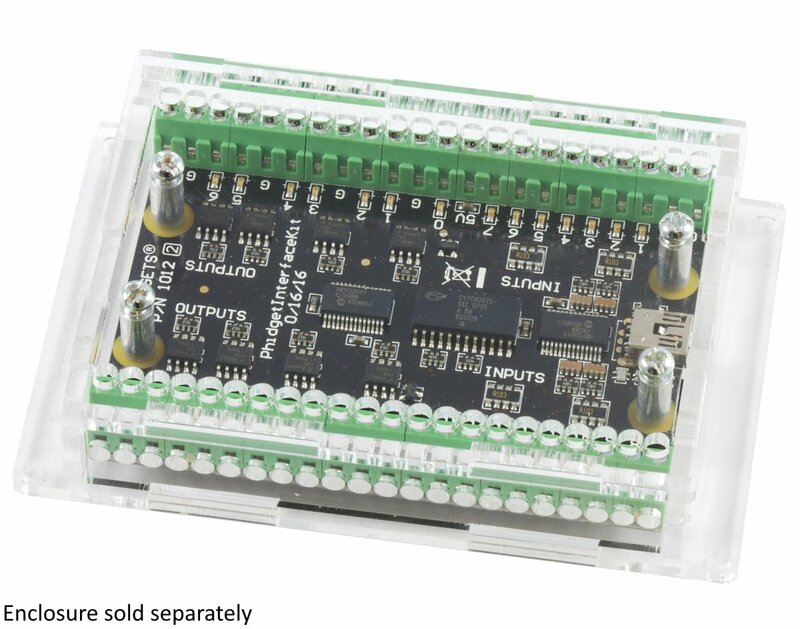 The Output acts as a switch to ground, so the circuit you're switching will need an external power supply. Each output is protected from transient voltages typical when switching inductive devices - relays, solenoids, motors. 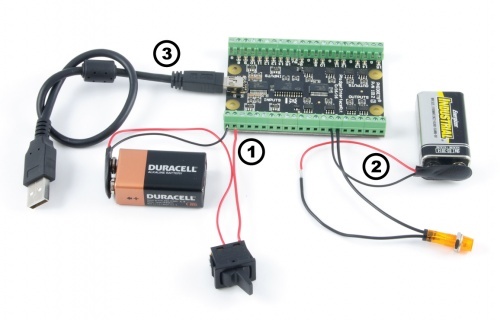 The Outputs can be used to directly control devices requiring substantial power such as incandescent lights, high power LEDs, relays, solenoids, motors. 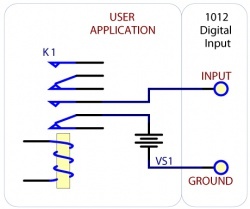 Digital Inputs: By connecting a power supply and a switch (or the 5V pin of the 1012 and a switch) you can test the digital inputs of the 1012. 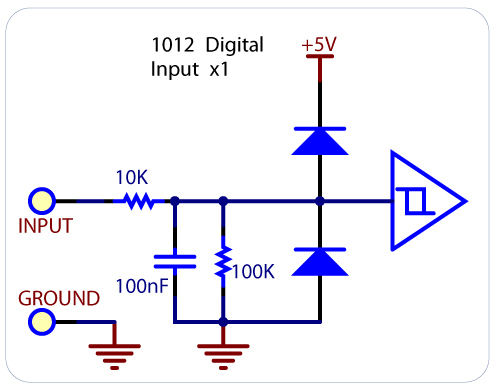 Open Collector Digital Outputs: Connect a load (like a light bulb or LED) in series with a power supply and connect one end of the series to a digital output and the other to ground, as pictured. Now that you have everything together, let's start using the 1012! In order to demonstrate the functionality of the 1012, the Phidget Control Panel running on a Windows machine will be used. Linux users can follow the getting started with Linux guide and continue reading here for more information about the 1012. This is an active-high device, therefore, it will be true when connected to a high input and false when connected to ground. Toggle the state of the digital output by pressing the button. 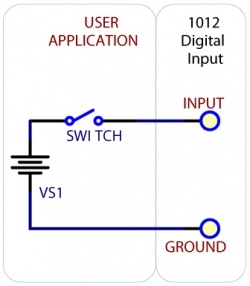 Remember, the 1012 simply acts as a switch to ground. 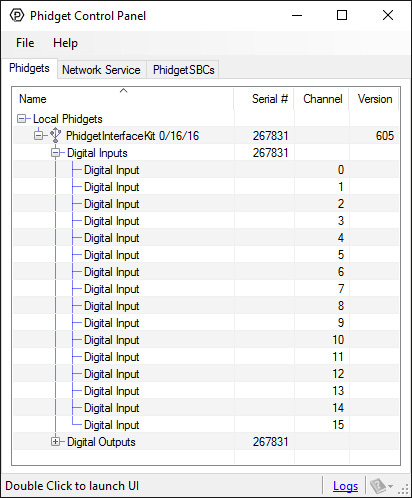 This Phidget is compatible with the DigitalInput Examples, and the DigitalOutput Examples. 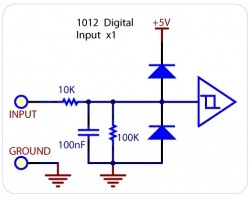 For more information on the 1012's digital outputs, see the Open Collector Digital Output Primer. All of the digital inputs have built-in filtering. This helps to eliminate false triggering from electrical noise. The input is first RC filtered by a 10k/100nF node, which will reject noise of higher frequency than 1kHz. 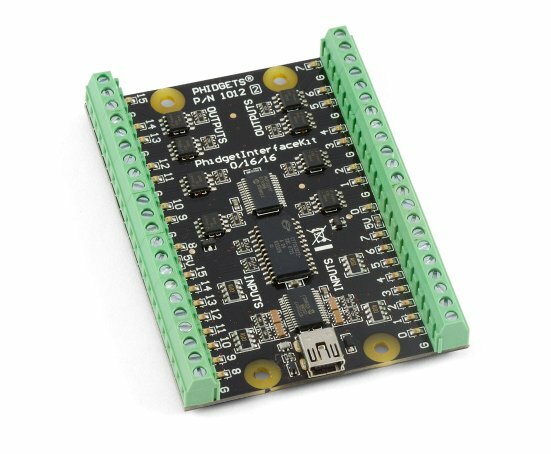 This filter generally eliminates the need to shield the digital input from inductive and capacitive coupling that is likely to occur in the wiring harnesses. A simplified schematic of a digital input on the 1012 - Phidget InterfaceKit 0/16/16. To test your digital input, wire it up to a switch as shown in the diagram. The power supply VS1 needs to be within 4.2-30V DC in order to guarantee a response from the digital input when the switch is closed. Monitoring the position of a double-pole relay. If you have a double-pole relay (that is, a relay that is designed to close two switches at once with the same control input), you can switch a load with one pole, and monitor the state of the relay with the other pole. This can come in handy as a safety feature- if the relay were to fail, your software would normally not have any way of knowing. Unlike typical Phidget digital inputs, these are capable of receiving up to 30VDC. These inputs are active high: A voltage of 4VDC to 30VDC will be read as True or logical 1; below 1VDC will be read as a False or logical 0. 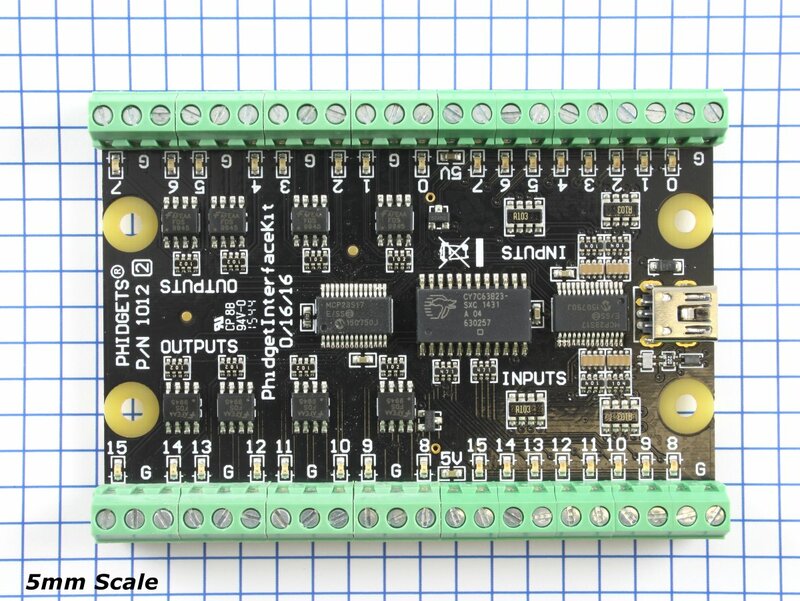 The input is high impedance, which means current flowing into the Phidget device will be limited. Ground terminals are provided in multiple locations along the input terminal strip; it is recommended that the ground terminal located nearest the input terminal be used.